John Legend and Jesse Williams have signed on to co-executive produce a new documentary, With Drawn Arms, which will follow the story of two Olympians who sparked a protest movement in 1968 that draws a direct parallel with that of Colin Kaepernick's today. 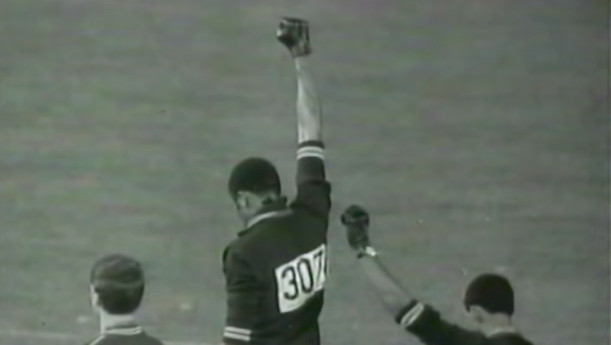 The premise of the documentary will highlight the historic XIX Olympiad in Mexico City in 1968, during which Olympic gold medalist and NFL wide receiver Tommie Smith and Bronze medalist and fellow Olympic Project for Human Rights member John Carlos raised their black leather gloved fists during the playing of the "Star-Spangled Banner," in protests against racial injustice. "We are excited to collaborate with true artists in Glenn Kaino and Afshin Shahidi to bring this powerful story to the world in a fresh and compelling way," Legend shared with Deadline. "In this current climate we are once again being charged to stand up to bigotry, fear and hate. We are inspired by this story and honored to be a creative partner on this film." As a result of the protest movements of Smith and Carlos, the duo were suspended from the American team and had to leave the Games under threat, with many viewing their gesture as a sign of Black Power. Smith later stated that it was a "human rights salute." He went on to continue his career as an athlete, playing for the Cincinnati Bengals for a couple seasons and earning several track and fields records, before going on to teach in Ohio and at Santa Monica College. "Tommie Smith is more than an iconic poster or risky act of defiance that inspires people the world over," Williams added. "He is a living man, whose incredible journey is worthy of examination. I couldn't be more excited to join forces with this team of filmmakers, to share his reality and challenge our notions of heroism in the process." The film is currently in production in L.A., with conceptual artist Glenn Kaino co-directing alongside former Prince collaborator Afshin Shahidi. According to reports, With Drawn Arms is aiming to be released around Oct. 16 of next year, which will coincide with the 50th anniversary of the raised salute by Smith, who is now 73.